Ideal for high speed production lines. -It delivers high quality codes at production speeds of more than 200 impression / minute (250 imps / min) with multiple line code printing. The innovating structure has an excellent behaviour in energy & cost saving. Web guiding system designed to suit each operational sequence. Fully automatic carton feeding unit with easy & quick adjustment. Totally enclosed construction with parts of S.S. and sintered bronze for long life operation of coder. It is electro mechanical fully automatic high speed coding system. Once stacks the labels / cartons in order on sloping plane tray (Dispenser) for feeding. It’s automatically picked up by rubber friction insert, fed to printing one by one via guide track. This system is similar to rotary letter press. Oscillating roller and dispersing an ink of even film thickness to inking roller and inking roller transfers ink to stereotype, finally image transfer to the substrate. 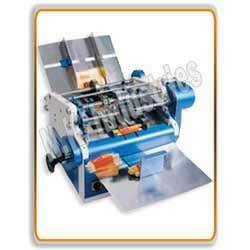 This cycle is continuously running at high speed with clear & sharp impressions. 0.25 HP/ 1440 RPM / 414 V 3 Phase & single Phase.